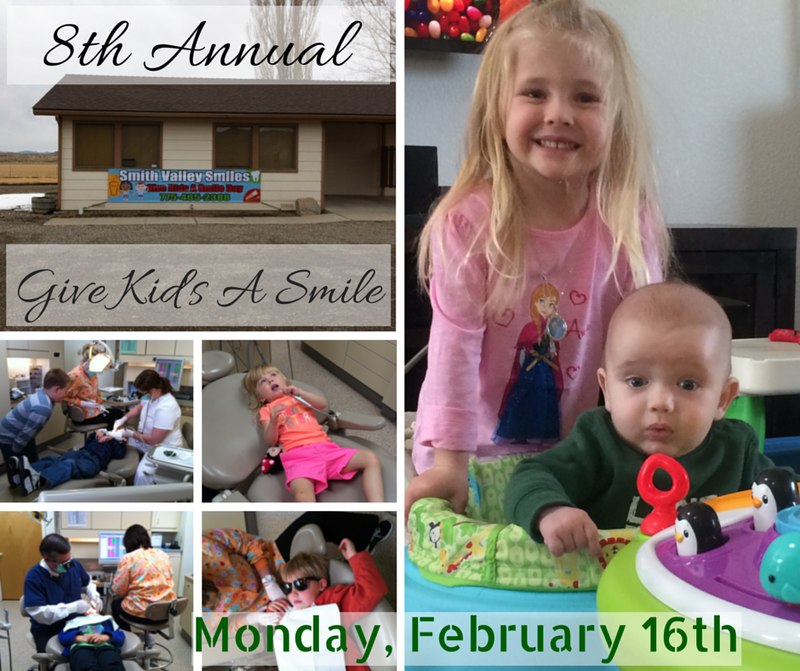 9TH ANNUAL “GIVE KID’S A SMILE DAY” AT SMITH VALLEY SMILES FAMILY DENTISTRY MONDAY, FEBRUARY 15th! DON’T MISS OUT THIS PRESIDENT’S DAY! It is that special time of year again in dentistry! February is National Children’s Dental Health Awareness Month. In recognition of this, Dr. Scott Leinassar, Dr. Andrea Leinassar, and their dental team provide a day of service for the children every year. This will be the 9th year we have offered this service, and we have expanded our services to include more dentistry for your children as needed, free of charge. We enjoy meeting new children and welcome those of you who have come to see us before. Dr. Scott and his wife, Marianne, have been providing access to dental care in Smith Valley since 1985. For 25 years Dr. Leinassar provided free dental screenings and education to Smith Valley’s 3rd grade classes. Dr. Andrea has been practicing with Dr. Scott since September 2007, and the practice enjoys extending this wonderful service to the children in their community including Yerington, Topaz Ranch Estates, Bridgeport, Coleville and the surrounding areas. On Monday, February 15th (President’s Day! ), Dr. Scott and Dr. Andrea with our dental team will be providing dentistry at no charge for your children. We have an amazing dental team that enjoys the opportunity to show your children that going to the dentist can be fun, in fact; we welcomed two new members to our team last year that enjoyed meeting and providing care for your children. We will teach them the importance of brushing and flossing, and give them the tools to do it, or if needed, we will address other priority issues as time and behavior permit. We also take x-rays and intraoral photos if possible for you to take with you after the appointment. And guess what? Taking x-rays on your children has never been easier for them or as safe. Technology has provided us the ability to take these images from outside the mouth with lower doses of radiation. We are excited to share this with you and look forward to meeting you! A parent and/or legal guardian must be present with the child at the appointment. We would please ask that you arrive 5-10 minutes early to your appointment as you will need you to read and sign consent and medical history forms. The office hours are 8am to 5pm. The office is located at 2311 Hwy 208 in Smith Valley. Please call our office at (775) 465-2388 to schedule an appointment and meet our wonderful team at Smith Valley Smiles Family Dentistry. Available spaces fill quickly and some restrictions do apply. We look forward to meeting you and are looking forward to “Giving Kids a Smile”. We thank you and are looking forward to another great year! It has been our mission to ensure the best health and well-being for all of our patients as well as our team. Due to the flu season and several illnesses related to the flu this time of year, we please ask that you not bring you or your children to our office with any cold or flu symptoms. Our team will be screening parents and patients for signs and symptoms of the flu, and if present, you and your child will not be admitted to the clinic for treatment on this day. We appreciate your cooperation. Dr. Scott Leinassar, Marianne Leinassar, Dr. Andrea Leinassar and the Smith Valley Smiles Team. Refined carbohydrates, such as in white based pizza sauces and pastas, contain simple sugars that are able to quickly dissolve, causing acid that attacks tooth enamel. Heavily pigmented foods such as certain spices and sauces within Chinese and Indian foods, as well as tomato based sauces, contain properties that can easily stain your teeth. It has been suggested that if you are going to be eating any of these foods, you begin your meal with a green vegetable such as spinach or broccoli. Green veggies form a protective film on the surface of your teeth that creates a less porous surface for staining foods to be able to adhere to. Therefore, your teeth have a slight barrier to stop those yummy sauces and spices from staining your teeth! Even when you think you are reaching for a healthy pre-made sandwich; take a look at the ingredients contained within. Some contain hidden sugars and calories, as well as an overload of salt. High amounts of salt, sugar and calories not only cause harm to your tooth surfaces and enamel, they can also contribute to high blood pressure or even a stroke! So the next time you reach for what you think may be the “smart option” take a little peak at the ingredients, especially those contained in the spreads or sauces. If there are high amounts of sugar or salt, you may want to consider a different option. So remember; always, always brush your teeth twice a day, be sure to regularly floss and schedule regular dental check-ups! Bon appétit! It is that special time of year again in dentistry! February is National Children’s Dental Health Awareness Month. In recognition of this, Dr. Scott Leinassar, Dr. Andrea Leinassar, and their dental team provide a day of service for the children every year. This will be the 8th year we have offered this service, and we have expanded our services to include more dentistry for your children as needed, free of charge. We enjoy meeting new children and welcome those of you who have come to see us before. Dr. Scott and Dr. Andrea with our dental team will be providing dentistry at no charge for your children. We have an amazing dental team that enjoys the opportunity to show your children that going to the dentist can be fun, in fact; we welcomed two new members to our team last year that enjoyed meeting and providing care for your children. A parent and/or legal guardian must be present with the child at the appointment. We would please ask that you arrive 5-10 minutes early to your appointment as you will need you to read and sign consent and medical history forms. Office hours are 8am to 5pm and is located at 2311 Hwy 208 in Smith Valley. Please call our office at (775) 465-2388 to schedule an appointment and meet our wonderful team at Smith Valley Smiles Family Dentistry. Available spaces fill quickly and some restrictions do apply. We look forward to meeting you and are looking forward to “Giving Kids a Smile”. We thank you and are looking forward to another great year! It has been our mission to ensure the best health and well-being for all of our patients as well as our team. Due to the flu season and several illnesses related to the flu this year, we please ask that you not bring you or your children to our office with any cold or flu symptoms. Our team will be screening parents and patients for signs and symptoms of the flu, and if present, you and your child will not be admitted to the clinic for treatment on this day. We appreciate your cooperation.